Tai chi, an ancient Chinese martial art that is often referred to as "moving meditation," is getting popular in fast-paced New York City and neighboring areas. "More and more people have been joining, not only Chinese or Asians, but also people from various races and cultural backgrounds," said Sitan Chen, founder and chairman of Tai Chi Qigong Association of America (TCQAA), in an interview with Xinhua, on the sidelines of the 2018 Tai Chi & Health Qigong Festival held in Westbury, New York, in early June. Now in its seventh year, the Tai Chi festival featured various presentations, demonstrations and mini-classes joined by dozens of teams from the New York City metropolitan area. Chen, a world Tai Chi champion who started his martial arts career at the age of six in China, initiated the event in 2011 with his wife, Xu Lin, also a Tai Chi master. The couple founded Sitan Tai Chi and Martial Arts in 2007 in New York to promote Tai Chi and provide a forum for those interested in the ancient sport. "We wanted to start something that the general public would benefit from," said Lin, also a TCQAA board member. "Not anyone can just pick up Chinese," said Wei Fang, fellow board member of TCQAA. "But Tai Chi is a body language; there are no barriers in learning it." Both of Fang's kids are learning Tai Chi. "This is a cultural treasure that our ancestors have passed to us," Fang said. "Even though both of my kids are born and raised in the U.S., I hope they can learn about this culture and pass it on." Tai chi's slow, graceful movements are accompanied by deep circular breathing. The movements work with what is called "qi" or life force, a type of "flow" that everyone has, according to Chinese culture. There is growing evidence that this mind-body practice, which originated in China as a martial art, has value in treating or preventing many health problems. This gentle form of exercise can help maintain strength, flexibility and balance, and could be the perfect activity for the rest of your life, said a research by Harvard Medical School. For 13-year-old Qifei Huang, Chinese martial arts meant a turning point to his interest and acceptance of Chinese culture. The boy grew up in the United States, and started learning martial arts at the age of four. "I didn't like learning Chinese," Huang said. "But martial arts gave me a chance to learn about the Chinese culture." Being part of the U.S. youth martial arts team, Huang had the chance to exchange in China at fifth grade. "I couldn't communicate in Chinese before going that," Huang said, "But I could when I came back." Talking about his future, Huang said, "I want to be an actor. If I put martial arts and Chinese culture in movies, people will see how amazing it is." "Tai Chi is a shortcut to understanding the Chinese culture," echoed Chen. "It's not simply a sport; the Chinese culture, philosophy, and humanitarian ideals are all imprinted in Tai Chi." 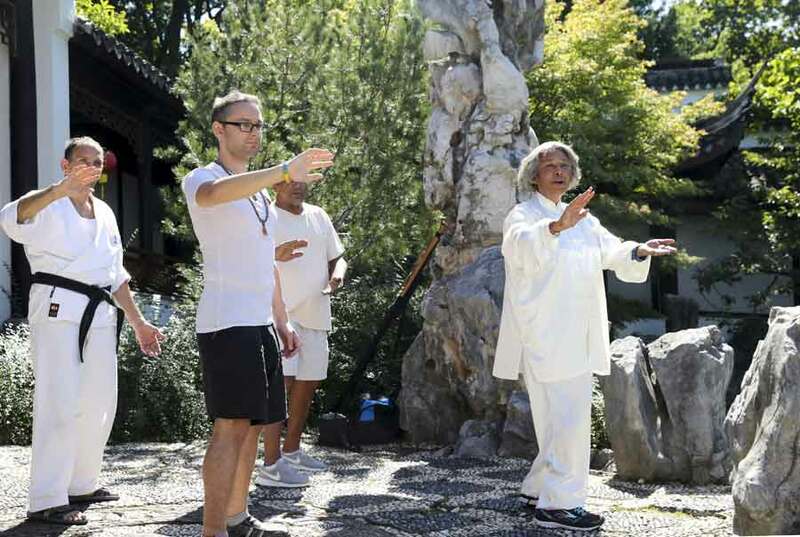 Antonio Livio, a member from Tai Chi Qigong Team at The Seasons, a senior living home in New York, has been learning and practising Tai Chi for four years. "I enjoy the philosophy of the Asians and also of Taichi," he said. Tai Chi is considered a flexible, fluid and connected practice that combines ancient martial arts, Taoist philosophy and traditional Chinese medicine. More and more people in the world are chasing longevity, stress reduction and improved health through the mind-body practices. "Tai Chi is a sport that is relaxing and calming. It's different than (normal) martial arts, which is very aggressive," Huang said. "Especially in larger cities like New York, people are constantly distracted and stressed. They need to keep calm and learn Tai Chi. This sort of slow-paced lifestyle is good for both mental and physical health," said Chen. "As a Westerner, you know, everything is done fast, but in the Tai Chi world you do things slow," said Livio. "It teaches you how to live a peaceful and healthy life." Jason Warshaw, who started practice of Tai Chi about four years ago, agreed. "I think the Western mind likes to do things quickly, and then you realize that, maybe you could go a little slower. They will start to appreciate the process," he said. "We all hope for peace, where does peace come from? It doesn't come from fighting, it comes from inner peace," Fang said. "It's about harmony between man and nature. Our motions might be slow, but we arrive at our destination fast. Through this calmness, we find the true direction of life. Otherwise no matter how busy we are, it's all for nothing." "There is great value in fostering cultural communication and promoting these values," said Lin. Most health research into the benefits of Tai Chi focuses on people over 50. But the earlier one starts in life, the more one reaps the rewards, Chen said. "There is great danger when seniors fall or lose their balance, and Tai Chi helps with that," said Chen. "It' s also safer and not aggressive." "As you get older, Tai Chi helps with the balance and the circulation," said Livio, "Then for the Qigong, it helps the internal organs. It all blends in and it's very good for a person to keep more mobile, stronger and better with the mind." "However, it is a misconception that only the elderly can practice Tai Chi," noted Chen. "Younger people learn how to focus, how to calm down and persevere through Tai Chi." "Tai Chi helps with younger people with their mental strength and ability to adjust under pressure," added Lin. "Our younger pupils had the chance to perform at the United Nations with a professional Tai Chi team from China," Fang said. "This has encouraged many kids and their parents to learn Tai Chi." "There has been more and more younger people who are practising Tai Chi, and we have a youth group for contestants under 18th in our Tai Chi competition in New York," Chen said.